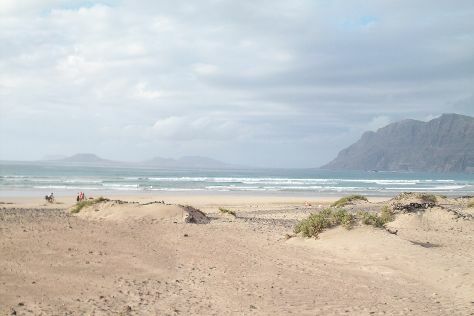 Visiting Playa de Mogan and La Charca will get you outdoors. Eschew the tourist crowds and head to Playa de Amadores and Vegueta. Explore the numerous day-trip ideas around Maspalomas: Teror (Casa Museo de los Patronos de la Virgen & Basilica de la Virgen del Pino) and Playa de Las Canteras (in Las Palmas de Gran Canaria). And it doesn't end there: kick back and relax at Playa de Maspalomas, stop by Tresor Noir, enjoy the sea views from El Faro de Maspalomas, and browse the different shops at Yumbo Centrum. To see maps, reviews, other places to visit, and tourist information, use the Maspalomas sightseeing planner. Use the Route module to find suitable travel options from Lausanne, Switzerland to Maspalomas. The time zone changes from Central European Time to Western European Time, which is usually a -1 hour difference. Prepare for much warmer weather when traveling from Lausanne in December: high temperatures in Maspalomas hover around 26°C and lows are around 19°C. Finish your sightseeing early on the 27th (Tue) so you can fly to Corralejo. Give yourself a bit of retail therapy at komodo and Trecepeces Fuerteventura. Discover out-of-the-way places like El Cotillo Beach & Lagoons and Faro de la Entallada. When in Corralejo, make a side trip to see Caleta Cycles in Caleta de Fuste, approximately 46 minutes away. The adventure continues: look for all kinds of wild species at Parque Natural de Corralejo, look for gifts at Pulau Mi, and enjoy the sand and surf at Caleta del Marrajo. For other places to visit, ratings, reviews, and other tourist information, you can read our Corralejo custom trip planner. 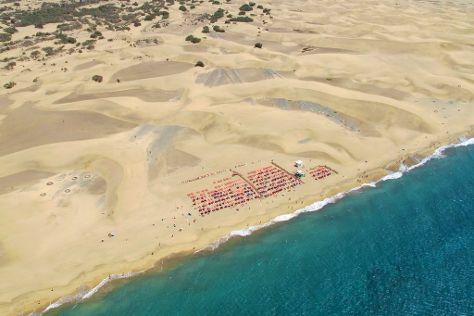 You can fly from Maspalomas to Corralejo in 3 hours. Alternatively, you can do a combination of car and car ferry; or ride a ferry. Expect a daytime high around 24°C in December, and nighttime lows around 19°C. Wrap up your sightseeing on the 30th (Fri) to allow time to travel to Lanzarote. Today, the entire island is a World Biosphere Reserve, with over 500 different kinds of plants, 17 of which are endemic. You'll explore and learn at Fundacion Cesar Manrique and Galeria de Arte Enmala. Satisfy your inner culture vulture at Cabra Cabra Galeria De Arte and Castillo de Santa Barbara. Explore Lanzarote's surroundings by going to Puerto Del Carmen (Island Watersports & Esennia), Playa Blanca (ElisabethConcept & Puerto deportivo Marina Rubicon) and Haria Artesanal (in Haria). And it doesn't end there: explore the fascinating underground world of Cueva de los Verdes, examine the collection at Bodega El Grifo - Museo del Vino, pause for some serene contemplation at Lady of Sorrows Mancha Blanca Church, and stop by Queseria El Faro. To find ratings, maps, and other tourist information, you can read our Lanzarote travel planner. Getting from Corralejo to Lanzarote by combination of taxi and ferry takes about an hour. Other options: do a combination of bus and ferry. Expect a daytime high around 26°C in December, and nighttime lows around 18°C. Finish up your sightseeing early on the 3rd (Tue) so you can travel back home.